Here’s a great photo posted in the Friends of Sugar Loaf group by Scott Hedberg. Left to right they are Peppi Teichner, Jean Sweeny Raymond, Pixie Hoffman, Corky Beals, Bruff LaVan, Tom Kuhnan & Art “Major” Huey. 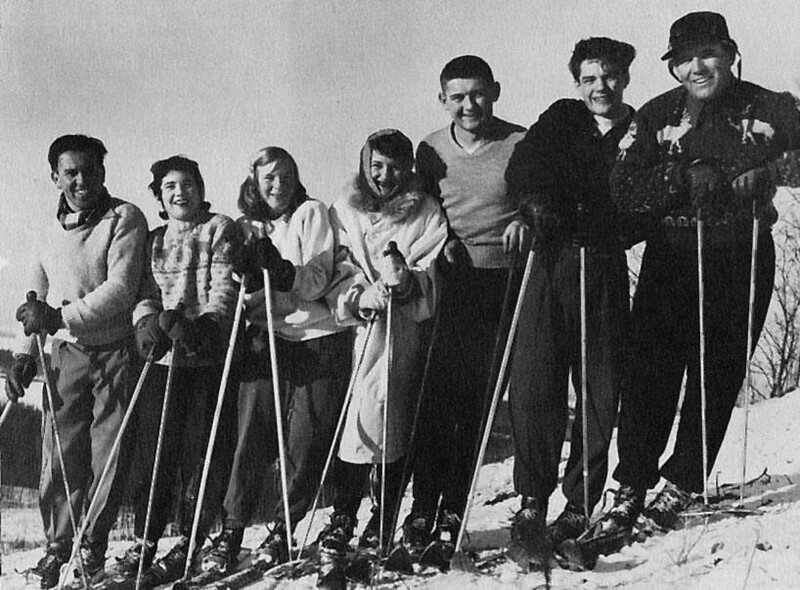 Hans “Peppi” Teichner is best known locally for having taught a region to ski – everyone from Helen Milliken to children with disabilities – and as one of the founders of Sugarloaf. But his history before coming to this country is equally as compelling. Peppi was a national ski champion from Germany – and a Jew –who was coaching the Spanish Olympic Team when Hitler rose to power. Teichner also was instrumental in developing Holiday Hills in Traverse City. I’m thinking that his army buddy was Stanley Ball. Anyone? See another photo of him right here, read a little more about the early days of skiing in Leelanau from the Enterprise, and share and see photos of Sugar Loaf through the Sugar Loaf Mountain Club. The Sugar Loaf Mountain Club is hard at work, getting the Loaf ready for skiing this winter – connect with them on Facebook! I think the army buddy may have been my grandfather, Harry “Bud” Raymond. He was in the 10th Mountain Division and is from Leelanau. Went to the Leelanau School, built our family home on Sleeping Bear Bay in the 50’s, was a Sugar Loaf nut, and talked about Peppi a fair amount. He’s not in this photo but my great aunt, Jean Raymond, his sister-in-law is there. I think there may be some old war-time and post-war letters in our cottage up north. What a fun photo!!! Cool – thanks for sharing that Carrie. It is a fun photo indeed. Art Huey was the founder of the Homestead, so there was a lot of firepower in that picture!